Of course we slept in on the first morning of vacation – what else would you expect from us? We finally got up and around by late morning. (A very late morning according to Central time, but it’s vacation, right?) First, we took care of business; we called Emeril Laggasse’s restaurant, The New Orleans Fish House, to make dinner reservations for Sunday night. Then we called Hoover Dam to make reservations for a Hard Hat Tour on Monday afternoon. With the ‘work’ for the day completed, we decided to investigate our own hotel before venturing out into the scorching desert sun. Amazingly, our theory from the previous night was confirmed - we had to wander through the casinos in our hotel to find the desk where we could purchase tickets to gain access to the towering edifice above our hotel. The tower stands 1149 feet above the street; the tallest building west of the Mississippi as well as the tallest freestanding observation tower in the US. The world’s highest roller coaster is housed atop the tower (the High Roller Roller Coaster) as well as the Big Shot Thrill Ride (a vertical acceleration ride). Of course we eventually found the ticket counter and purchased passes for the ride to the top as well as for each of the two thrill rides. The double elevator whisked us to the top at a rate of 3 floors per second. After exploring the ‘look out tower’, we decided to experience the roller coaster. We found it to be rather non-eventful actually, simply wrapping around the building several times. No loops, no upside downs. I suppose if one had a fear of heights, things might get interesting. However, Kurt officially deemed the ride as ‘weak’. Thankfully, we saved the Big Shot Thrill Ride for last. It turned out to be ‘a little interesting’. Once we reached the top, we could see nothing but our feet below us, waving freely in front of a desert panorama. Incredible. After partaking in the adventures, we browsed through the shops in our hotel. Nothing outstanding. We were amazed, however, that such a large array existed below where we slept. We did discover several restaurants perhaps worthy of subsequent trial. Once the meal was completed, we decided to investigate the Luxor Hotel. We located the Imax Theater, one or two virtual reality rides, and a couple of other ‘family oriented’ activities. We were impressed with the engineering of the building; the rooms are built around the outside of the pyramid with the center remaining open for internal structures resembling an Egyptian city – a little strange. Instead of elevators, the hotel had ‘inclinators’ located in each of the four corners. These inclinators rose on an angle instead of the vertical. Remembering our ‘Capital Quest’ from our trip last summer, we decided that the top-most floor of the hotel must be conquered. Unfortunately, the task was going to be complicated as we discovered a room key must be shown to enter the inclinator. As a consequence, we determined that we needed to gain access to at least the 6th floor to avoid this annoyance and set off to find the fire escape, which proved to be no trouble. After arriving on the 6th floor, we nonchalantly glanced over the edge of one of the balconies then set out to find the inclinator. Riding in an inclinator is not so different from riding in an elevator, except the perception of moving sideways is much more prevalent. To our chagrin, we discovered that the inclinator we were on ascended only to the 12th floor! Getting off on the 12th floor, we contemplated how to gain access to the floors above. We circled the square (I know, I know…) and found that three of the four corners did not have access to the inclinator; the only inclinator access went down! Not the direction we wanted to go. Surmising that one of the four inclinators had to reach the floor above us, we again set out to find the fire escape. Sure enough, the inclinator on the 13th (oops, the 14th) floor served the 14th-19th floors. Following this example, we had to climb several floors in the fire escapes and ride each of the 3 remaining inclinators to gain access to the very top floor (the 30th floor). Alas, the 30th floor did not have a view of the chasm below. We had to back track to the 28th floor in order to find a balcony that provided a view of the abyss. It was worth the work; we had a view straight down 28 floors as the floors below us were inset several yards due to the shape of the pyramid. After snapping a few photos, we rode the inclinator down to the main level and strode right past the guard without showing a room key! We moved back inside and decided to see how much tickets were to the see a production of the Blue Man Group - $75. We decided to see what else was playing in the area and left the Luxor Hotel. Only a brief expedition into the Excalibur Hotel across the street was needed. It was obviously older and didn’t appear to have as many amenities (boring) as competing hotels. We quickly moved on. Next on the route was New York New York. And we thought we were in Vegas! We walked into the hotel through a mock-up of Grand Central Station. After a few twists and turns, this opened up to the casino floor. Certain areas of slot machines were designated as burrows: Queens, Brooklyn, etc. In the distance, on the back wall of the casino, you could see the river and Manhattan Island beyond. What got our attention the most, from the balcony we were standing on, was the rotating Statue of Liberty atop a group of slot machines. 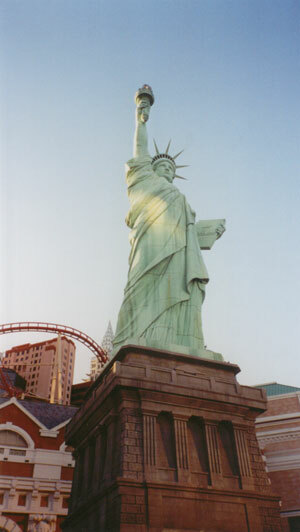 This was not just a mock up of the Grand Lady, but more of a cross between the Statue of Liberty and Marilyn Monroe. It was truly a predicament in which I had never imagined to see the Statue of Liberty. Our ultimate mission in the New York New York was to ride the roller coaster. After our disappointment with the roller coaster on top of the Stratosphere, we resigned to ourselves that we would find and ride the best roller coaster in Vegas. We had heard from various ‘thrill enthusiasts’ that the coaster at the New York New York was not too shabby. 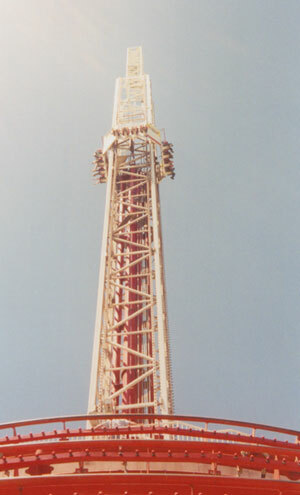 This coaster, the Manhattan Express, loops and dives around the perimeter of the ‘skyscrapers’, high above the Strip. Perfect. Of course, to find the entrance to the Manhattan Express, we had to wander through the casino and around the arcade on the next level. Finally, we found the entrance, only to learn the coaster was shut down for the next 45 minutes or so. Drat! Well, the hotel’s tactics worked this time, as we found ourselves trapped in the arcade, unable to get out! I must say that the New York New York’s arcade was the best we saw on the strip. We found ourselves attempting to make goals by literally kicking a soccer ball past a goalie; navigating through a slalom course and negotiating ski jumps on water skis; speeding through the mountains in a Formula One race car. Once we had lightened our load of quarters (it was Las Vegas, you know), we decided to check on the coaster one more time. The attendants still said it was closed. I knew as soon as we walked out of the hotel, it would start up again. We ventured back outside into the daylight. Oh yeah, another Vegas standard; no windows and absolutely no clocks exist anywhere near the casino floors. We walked around the Statue of Liberty outside the hotel (this one ‘dressed normal’), and crossed the Brooklyn Bridge. Sure enough, just as soon as we snapped a few pictures of the bridge, I heard the sound of ‘coaster screams’. Looking up, we discovered that the Manhattan Express was once again operational. We ventured back inside to the coaster entrance and stood in line for maybe 5 minutes. In all, the coaster was above average. There were several loops and surprising turns, including one twist that caught us off guard and suspended us upside down for several moments. In all, it was worth going back for. Oh, and we noticed one other thing that Kurt just couldn’t get enough of – the manhole covers in the floor of the hotel gave the illusion that steam was seeping out from around the edges of them. Pretty good attention to detail. The next casino in line was the Monte Carlo. After a brief look around, we decided it wasn’t much different than any of the other casinos. It was fairly fancy, but obviously a couple of years old. After venturing through the vast sea of slot machines, we found another tram. Once again, it sounded like a very good idea to sit down for a while. The tram took us to the Bellagio – probably the classiest hotel on the Strip. The inside was astoundingly gorgeous; marble floor and walls, a wedding atrium filled with ample natural light and luscious green plants. Over all, a very grand hotel. While we were wandering through the abyss of slot machines, video poker machines, and betting tables, we stumbled upon a very comfy looking bar next to the sports betting area. We found seats at the bar and ordered a beer. In a round-about way, the bartender told us that if we spent $10 a piece on video poker while we were sitting there, he could give us our drinks for free. Of course we did the math and figured that we needed to drink at least 2 beers a piece ($5 a beer) in order to break even – that is if we could manage to avoid losing money on the game. Well, I faired well. I walked away with a few extra dollars even after the tip. Kurt, however… well, he ended up paying $7.50 for each beer, plus tip. I’ll let you do the math. Kurt and I decided we liked playing video poker the best of all the machine games in Vegas. Slot machines just leave way too much to chance and neither of us like gambling enough to put down the stakes required at betting tables. The poker machines we found in the Bellagio, though were better than what we found elsewhere. These machines gave a ‘double or nothing’ chance after every win. As long as you played conservatively, it was rather fun. After we finished our beers, we wandered through the rest of the hotel and then back out the front door to the Strip. We noticed it had gotten dark while we were inside… and we also noticed that it was about time for their water show. In front of the Bellagio is a large reflecting pool. Every 15 minutes or so, an ensemble of computerized lights and water jets choreographed to music entertain the passers-by. The show is really quite spectacular with the water at times shooting as high as 60 or 70 feet. The show really gave the impression of a synchronized swimming performance. It’s a must-see if you’re in Vegas – and it’s free! We continued our trek north on the Strip to Caesar’s Palace, which was all under construction in the front. It was easy enough to get into; there were moving walkways that transported you into the hotel. However, there were no walkways to move people out… hmmm… Once we got inside, we casually ambled through the array of shops. We didn’t find anything too out of the ordinary, so we continued on down the street to the Mirage. 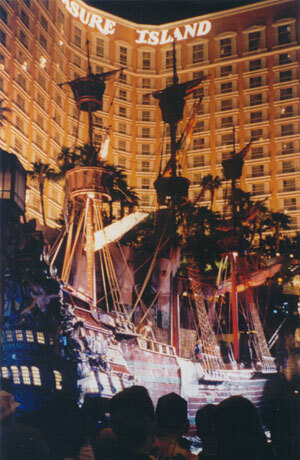 Like the night before, we followed the throngs of people inside the main entrance to the Mirage. Immediately inside the entrance, we found ourselves face to face with a white tiger (OK, he was in a cage). The Mirage is the home of Siegfried and Roy – the magicians whose trademark is a pair of white tigers. We watched the tiger for a while and decided he didn’t look so happy and definitely did not want to be where he was. We felt sorry for him and continued on. As soon as we entered the hotel, we were engulfed by a lush rain forest. We followed the narrow, winding path through the greenness and out onto the casino floor – surprise, surprise! After meandering through the ostentatious collection of slot machines, we found the hotel’s ‘family’ attractions, The Secret Garden of Siegfried and Roy and the Dolphin Habitat, both of which were closed. Consequently, we found our way back outside to watch the volcano erupt. This was the same volcano as the night before, only this time we got to see it up close. The eruption consisted of plumes of flames and jets of water projected into the air (the water was colored by red lights). The flames were so intense that we could feel the heat coming off them even though we were standing a good 100 yards from the source. Next, we moved on to Treasure Island. This night we were about 15 minutes early for a show. There were already tons of people standing around to catch the production; so many in fact that it was difficult for pedestrians to maneuver through the mass. We secured an open spot on a walkway between the sidewalk and the street and tried to find something to lean against. We were both so incredibly tired of walking by this time. It was horrible to think that if this made us tired, how was the Canyon going to make us feel? After Treasure Island, the Strip really went downhill. The next casino was the New Frontier – we went in and gawked around. It really did look like it was from an era were the west was the new frontier. After grandiose hotels like the Venetian and the Bellagio, this place was a dive. We quickly left. Next – the Stardust. Unfortunately, this hotel was not too much better than the New Frontier. And since Kurt still wouldn’t go see Wayne Newton with me, we moved on very quickly. The next couple of hotels – the Westward Ho and the Slots of Fun – were absolutely no better than either of the previous two. We couldn’t understand how these casinos could stay in business with all the competition down the street. You could tell they were the ‘original’ style Vegas casino. Before all the glitz and glam and ‘family fun’ moved into town. Finally, we made it to Circus Circus, the last hotel on the Strip except for the Stratosphere. We roamed around the ‘big top’ for a bit. Knowing that Circus Circus was the first hotel on the Strip to cater towards a family, we could definitely see where New York New York had gotten the idea for their arcade. The arcade area in Circus Circus wasn’t near as up-to-date, though, consisting mostly of carnival games. Once again, we decided we needed to sit down, so we found a seat under the ‘big top’ and watched a show for a few minutes. The shows at Circus Circus are short, ten-minute productions ranging from high wire acts to magic acts to dance numbers. We got to see a basic ‘human pretzel’ partner dance. It was rather boring but at least we were able to sit down!